One of our all time favorite horror movies is Evil Dead. A few years ago when we found out that Starz was going to be doing a show featuring Bruce Campbell returning as Ash, we were beyond excited. Now Ash vs. Evil Dead is heading into it’s third season with the Season 2 Blu-ray debuting today! 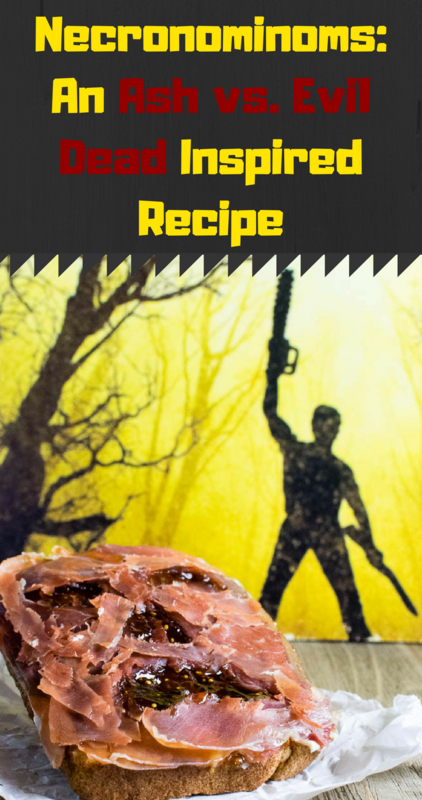 To celebrate the release of Season 2, we’ve come up with a deliciously groovy recipe for Necronominoms! When coming up with our Necronominoms, we went through several ideas. However, we wanted to create something that while gruesome looking, was actually very tasty. We’ve all seen the Necronomicon pizzas and cakes, so how could we be different? The answer was toast! 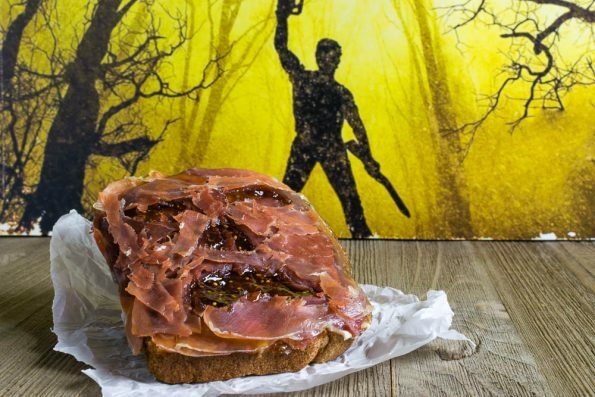 With the toast trend happening, why not give it a little horror flair? Next we needed the skin that covers the Necronomicon. Instead of using cheese like the pizza recipes, we went with prosciutto. 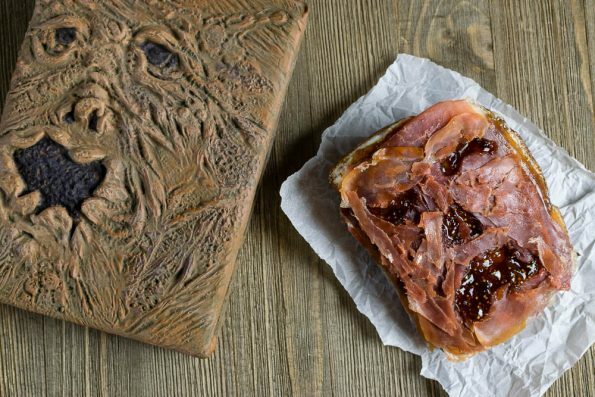 The prosciutto creates a skin like texture that is perfect! We hope you’ve enjoyed our recipe for Necronominoms! We are starting to gear up for Halloween! That means you need to tell us what movies you want to see recipes for! Leave a comment below or tag us on social media using the #GeekEats hash tag! We can’t wait to hear your ideas! Spread a layer of goat cheese on each slice of toast. Top goat cheese layer with fig preserves. Arrange 3 slices of prosciutto to fit bread. Trim the pieces to fit reserving trimmings. On a cutting board, cut out the eyes and mouth. Lay the prosciutto on the toast. Arrange trimmings to look like pieces of skin. Broil in oven for 1-2 minutes to crisp the edges of the prosciutto. This would be a great recipe for the next iteration of The Necronomnomnom. Totally! Feel free to reach out if you’d like us to contribute a recipe!